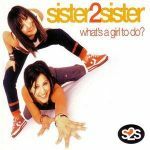 australian-charts.com - Sister 2 Sister - What's A Girl To Do? Probably better than Sister, but still only average. This is the only S2S song that I really like! Unironically a massive banger. Hook is absolutely huge. Find myself much more easily recalling this track than "Sister". <br>Radio-Pop halt. 3,8*<br><br>2000: #61 UK.